The Hanover Pennsylvania born and bred throttle stomper expertly steered his Drydene / Motorguard #1s Triple X to victory in the 38 lap main event to lead home Ian Madsen in second and Cory Eliason third in a photo finish for second place. Ian Madsen and Cory Eliason were the two main protagonists for much of the race lead battle before Schuchart eased himself in to the point position and simply refused to give it up. Jamie Veal was the KRGS Pole-sitter and boldly elected to take the D19 challenge and start the SWI #35 back in 19th position for a chance at $38,000 if he could still get the win. It was difficult for the Warrnambool Classic winner to get through the field however though fans greatly appreciated the effort to take the challenge and risk it all. 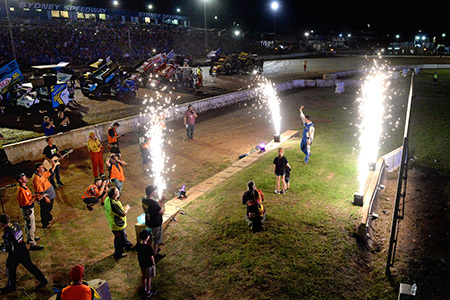 A huge crowd squeezed into the Valvoline Raceway for the last ever running of the Scott Darley Challenge and they weren't disappointed. The emotion, the excitement and the spectacle of the 10th anniversary event was on point. Schuchart had to survive a possible disqualification for not driving to the infield scales directly after the race along with the other top five combatants. The Pennsylvanian drove to the pit scales where he had been earlier in the night for his heat win instead and the decision to "DQ" him was later overturned by a judiciary who ruled that he hadn't driven past the scales he'd merely gone to the ones used in the pits mistakenly instead of the ones on the infield. Schuchart and his Queensland car owners John and Vicky Jane Weatheall could not wipe the smiles off their faces as the team picked up their best ever Australian result and a $19,000 payday. After blowing a motor in WSS action at Archerfield on Wednesday night the team were able to lease a motor from Ben Atkinson which was the difference in the team staying for the event or packing up and heading home.